Oriental lilies are prized for their intoxicating scent, rich colours, and visual splendour- so what better flower to arrange into a masterpiece? Some floral arrangements are considered artwork, and the Claire is no exception. Our florists have truly gone all out with this extravagant arrangement of ivory Oriental lilies. 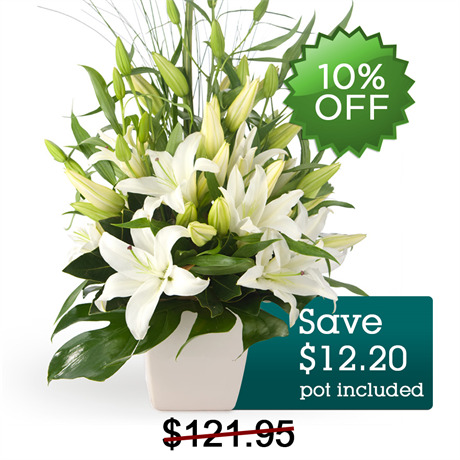 Artfully arranged in a complimentary ceramic pot, these pure white blooms are offset by lush foliage. One of our most popular floral gifts, the Claire is perfect for a corporate function, sympathy gift, extravagant birthday present, or as an expression of love.